Make the Invisible Visible. Introducing the new Multivariate Monitoring Module. Graz, Austria. DR YIELD, one of the leading providers of yield management software, announces the release of the new Multivariate Monitoring Module, now available as an add-on to DR YIELD’s YieldWatchDog 3.6 yield control software. Experience the new Multivariate Monitoring Module that allows you to get the maximum out of your data. It allows you to go beyond what is visible when looking at single parameters – statistical calculations allow you to correlate multiple parameters and detect behavior that is only visible when looking at a group of parameters. Extremely fast processing and calculation times are assured by deploying mechanisms such as the Principle Component Analysis. 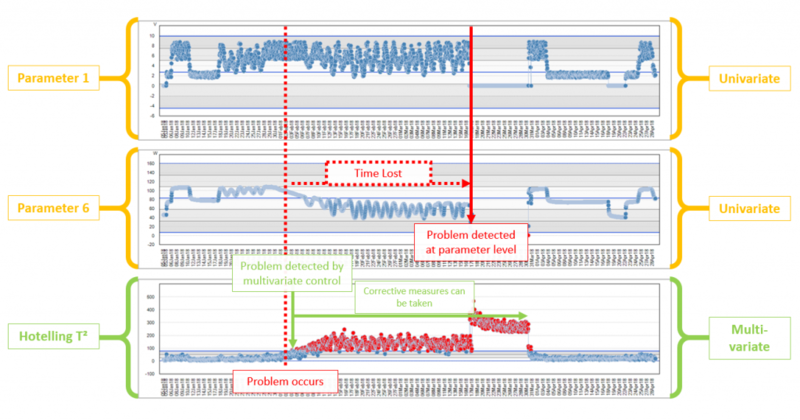 The figure above illustrates the timeline of two key parameters after a malfunctioning of a tool: The univariate monitoring of Parameters 1 and 6 does not show any anomalies in the data, as both remain inside their respective control limits. The Multivariate Monitoring Module (lower chart) correlates the parameters and is able to identify the problem immediately after its occurrence because it detects a change in the correlation between the parameters. Due to the immediate warning issued by YieldWatchDog, engineers are able to apply corrective actions much earlier. Contact us now to be the first to learn about the new Multivariate Monitoring Module. DR YIELD software & solutions GmbH is one of the worldwide leading providers of yield management software in the semiconductor industry. It serves customers worldwide as innovative provider of next-generation software for yield control. The patented software solution YieldWatchDog enables monitoring of all manufacturing data and allows early detection of potential production problems at an unprecedented level of thoroughness. Thus, costly yield excursions can be avoided due to early notifications. ← YieldWatchDog 3.6 – now even faster!